If you read my post yesterday, then you already know that I've lost about 10 pounds in the past 6 weeks. Yay, right?! Well, losing 10 pounds sounded great to me until I started to think about the 70 pounds I still need to lose to reach my ultimate goal weight. Yikes. Sometimes, thinking of the big picture isn't the best motivator. New Year, New Me. We've all heard that one before, right? While looking at the new year as a new chance to reach your goals can be motivational, it does have it's downfalls. Same goes for treating each week as that "new week where I'm going to reach all of my goals". I am guilty of doing this all the time. Actually, I was guilty of proclaiming that just yesterday. The thing is, starting the week with that kind of perspective can be motivational, however, what happens when you "blow it" on Monday or Tuesday? I don't know about you, but sometimes it makes me feel like this wasn't "the week" where I was going to get my act together after all, so I might as well try for next week instead. But, where does that leave me? It leaves another week in the dust of what could have been. It leaves days like Wednesday through Friday untouched just because it wasn't going to be "the week" for me, after all. That kind of thinking promotes the no-good-all-or-nothing mentality and, before I know it I'm saying things like "I'll have better luck next week, so what are we ordering out tonight, instead"? Today, I want to urge myself and anyone else who struggles with this problems to stop thinking of the big picture so much; to start added up the little moments in each day, instead. I want to look more at how each meal is either going to end up helping or hurting my progress. If I have a bad meal, it's not a reason to throw in the towel for the entire day. The next meal counts, too; for better or worse. While each week is indeed a fresh start; each day is, too. Furthermore, each meal is where the real success starts. For more success in losing weight, I want to focus more on the meal-by-meal instead of the day-by-day or week-by-week. My success is going to be gauged more on each healthy choice rather than the full tone of each day or week. For times when I feel discouraged about how long it will take to get to my all-time goal, I need to remember that it will take even longer to get there if I keep putting it off. The time is going to pass anyway, so I might as well make this time count. 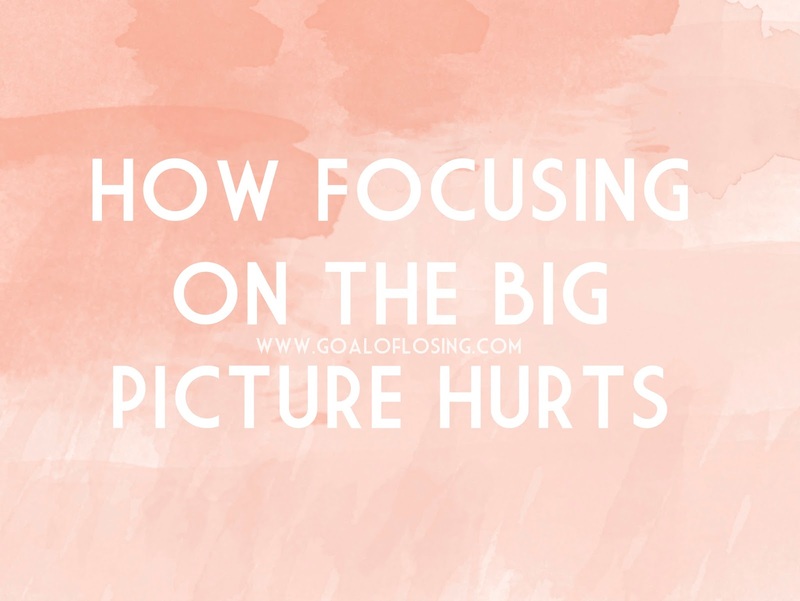 Focusing too much on the big picture tends to minimize our short-term goals. It makes our short-term goals seem like they aren't that big of a deal in the grand scheme of things, however, it's those short-term goals that add up to the big picture, in the end. Overlooking short-term goals delays progress. Worst yet, thinking of the big picture minimizes short-term success. I have lost 10 pounds in 6 weeks and instead of thinking about how great that is, I have been thinking about how much further I have to go. Instead of letting the big picture minimize my short-term success, I am going to focus more on how losing this 10 pounds really makes a difference for me right now. I can do this by picking up a 10 pound bag of potatoes in the store or my 10 pound dumbbell weights. While I'm holding that 10 pounds in my hands, I can think about how this is the amount of weight that is gone from my body; that is how much weight is lifted from my joints; that is how much weight I worked on losing these past 6 weeks and for now, it is enough. It may not sound like much when thinking of the big picture, but it truly makes a difference. It all adds up in the end. While I've given many reasons why focusing on the big picture can hinder weight-loss progress, there have been times when focusing on the big picture has helped. For instance, it helps me to occasionally visualize myself at my all-time goal weight. It's motivational to think about how it will feel once I finally get there; to think about how much more mobile and how much healthier I will be. Thinking of the big picture; of myself at my goal-weight, can give me that extra boost of motivation I need to make a healthier choice in the moment. All in all, every choice matters and every pound loss adds up in the end. Make every moment count. Kay, I feel like you just jumped inside my brain and wrote down everything I've been thinking about and feeling lately! I am struggling SO much with the all or nothing mentality, and it has really been getting in the way of me making any progress with my weight loss. Your "what are we ordering out tonight" comment really hit home with me, as it's a common occurrence in our home. Today I am moving forward, armed with these really important reminders you've laid out. Thanks for being so real!! !